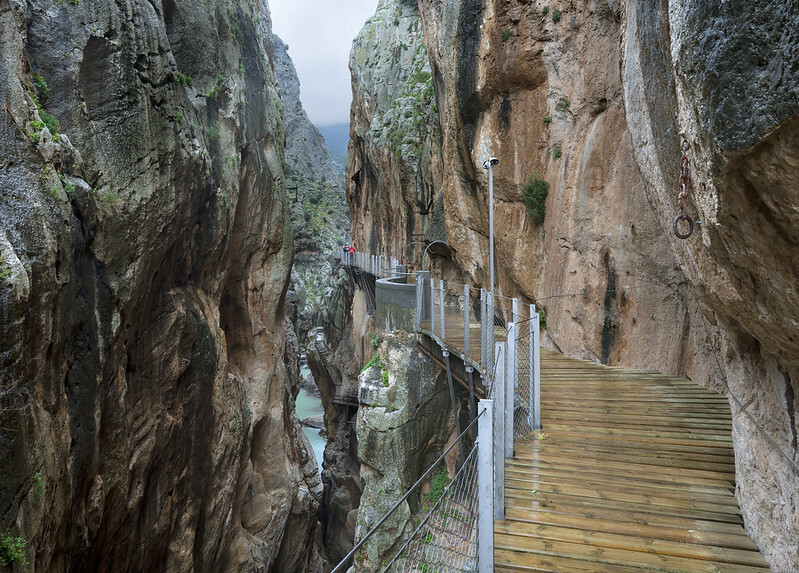 The King’s Little Pathway (Caminito del Rey) is anything but little. This suspended walkway brings visitors high up through the Gaitanejo and los Gaitanes gorge in the province of Malaga, an area of phenomenal natural beauty. The path was originally constructed in the early 20th century to enable the population of El Chorro, a local settlement, to access the hydroelectric plant where the majority of the inhabitants worked. With the walkway in place, the villagers could avoid travelling the long way around the mountain. Children used the route to walk to the nearby school and it formed a link between the communities living on either side of the mountain. In recent times, the King’s Little Pathway had become a popular hiking destination. However the crumbling nature of the aged structure resulted in it being dubbed “one of the world’s scariest hikes”. The risky walkway, built on the steep sides of the gorge, was therefore only accessible to the most daring of hikers. “The renovation of the King’s Little Pathway has secured and opened up this unique and special example of natural and industrial heritage to all visitors. Its improvement has been successful in attracting a new wave of tourism to the area, which has had a sustainable economic and social impact on the region”. The renewed pathway is now available to anyone who wants to enjoy a day getting closer to nature in the wonderful surrounding landscape. In an effort to preserve the heritage of the King’s Little Pathway, the conservation team constructed a path which incorporated or was just above the original walkway. The jury felt that “this passage, set within a truly awesome landscape, is a beautiful solution to the gradual deterioration of the path since its construction in the early 20th century. We very much appreciate the method by which much of the previous path has been left intact as it allows for a comparative view of the walkway while presenting the history of the area creatively. The interaction between industrial and natural heritage is to the advantage of both”.